Love or hate Manchester United, it’s fair to say they do enjoy a bit of success. Although the past few seasons have been a relatively lean time, they can still boast 20 league titles, 17 FA and League Cups, three European Cups/Champions Leagues plus a Cup-Winners Cup and Europa League thrown in. Up to 100m fans worldwide also help to sustain that success. And wealth. That level of support was not always the case, however, as a match programme coming up at the Mullock’s auction in Shropshire on November 30 demonstrates. For younger fans brought up in the ‘football history starts with the Premier League era’, this lot estimated at £3000-5000 may come as a shock. 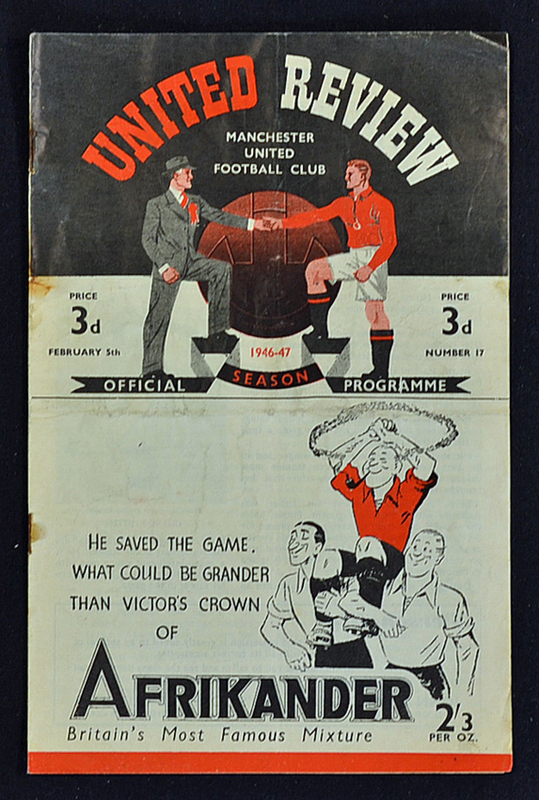 The hefty estimate for what is a programme covering a regular league game - Manchester United v Stoke City (programme No17, dated February 5, 1947) – gives a clue. That explains the estimate. Rarity means extra value, coupled with the fact that Manchester United memorabilia is always among the most sought-after in the sporting collecting market. 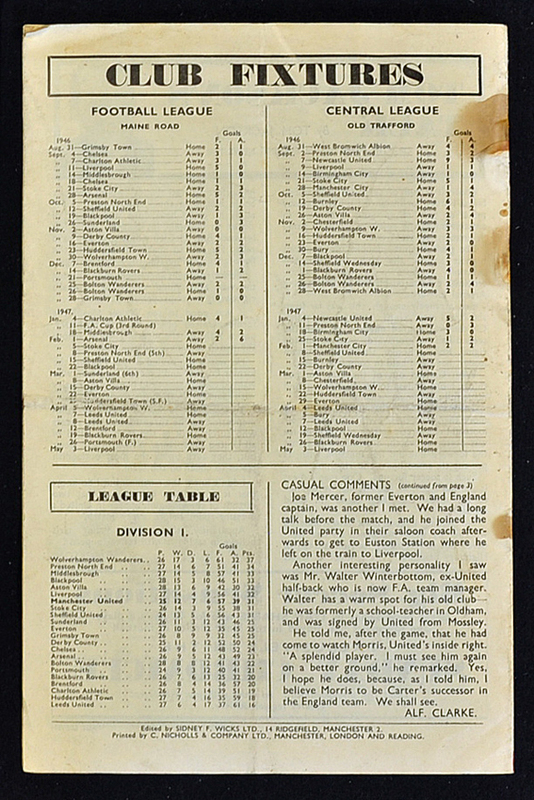 In 2012 an official one penny match card from the 1909 FA Cup final between Manchester United and Bristol City sold for £20,000 at Graham Budd’s sale in association with Sotheby’s, setting a record for any football programme at auction at that time. 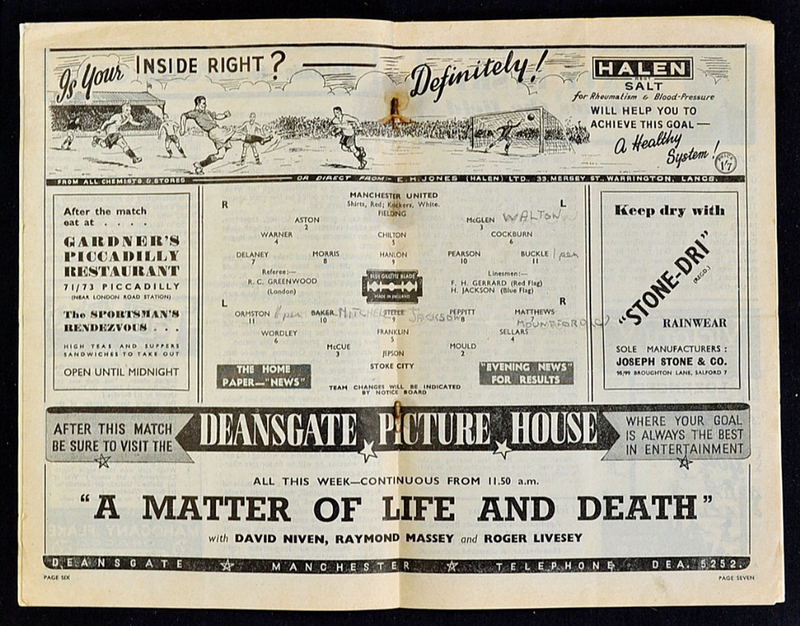 Inside pages of the Manchester United 1946-47 season match programme estimated at £3000-5000 in the Mullock's sale of November 30. Two more surprises for younger Man Utd fans: this programme No17 on offer at Mullock’s covers a game played at Maine Road, home for so many years of the Red Devils’ fiercest rival: Man City. From 1941-49 the Manchester teams both played at Maine Road because of bomb damage. Second surprise: as I type, Italian Serie A club Benevento had equalled a record for the most consecutive games lost at the start of a top-flight season (for the top five leagues now). Twelve defeats in a row. The holders of the record up until now? Manchester United, who lost their opening 12 games during the 1930-31 season. Mind you, they have done pretty well since.